Gilleaudeau, G.J., Frei, R., Kaufman, A.J., Kah, L.C., Azmy, K., Bartley, J.K., Chernyavskiy, P., Knoll, A.H. (2016) Oxygenation of the mid-Proterozoic atmosphere: clues from chromium isotopes in carbonates. Geochem. Persp. Let. 2, 178-187. Chromium (Cr) isotopes in marine sedimentary rocks can be used as a sensitive proxy for ancient atmospheric oxygen because Cr-isotope fractionation during terrestrial weathering only occurs when pO2 exceeds a threshold value. This is a useful system when applied to rocks of mid-Proterozoic age, where fundamental questions persist about atmospheric pO2 and its relationship to biological innovation. Whereas previous studies have focused on temporally limited iron-rich sedimentary rocks, we present new Cr-isotope data from a suite of mid-Proterozoic marine carbonate rocks. Application of the Cr-isotope proxy to carbonate rocks has the potential to greatly enhance the temporal resolution of Proterozoic palaeo-redox data. Here we report positive δ53Cr values in four carbonate successions, extending the mid-Proterozoic record of Cr-isotope fractionation – and thus pO2 above threshold values – back to ~1.1 Ga. These data suggest that pO2 sufficient for the origin of animals was transiently in place well before their Neoproterozoic appearance, although uncertainty in the pO2 threshold required for Cr-isotope fractionation precludes definitive biological interpretation. This study provides a proof of concept that the Cr-isotopic composition of carbonate rocks can provide important new constraints on the oxygen content of the ancient atmosphere. 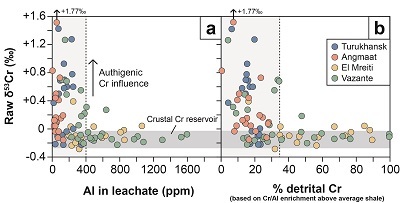 Figure 1 (a) Cross-plot of raw Cr-isotope values and Al concentration in the leachate. Dashed line is at 400 ppm Al. (b) Cross-plot of raw Cr-isotope values and % detrital Cr based on enrichment above average shale. Dashed line is at 35 %. 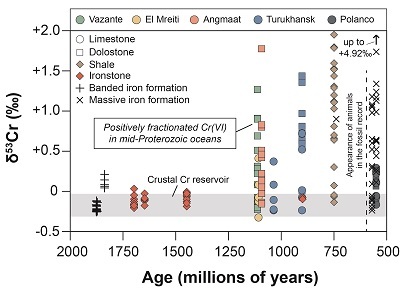 Figure 2 Compilation of all published Proterozoic Cr-isotope data including new data presented here. δ53Crauth values (after detrital correction) are presented for data from this study. 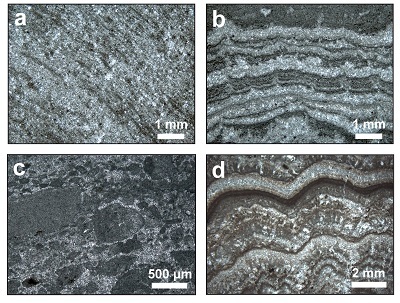 Figure S-1 Photomicrographs highlighting specific textural features in the (a,b) El Mreiti Group, (c,d,e) Turukhansk Uplift, and (f) Vazante Group. (a) Typical micritic limestone of the Touirist Formation. (b) Interval of fabric-destructive dolomitisation in the En Nesoar Formation. (c) Typical clotted micritic limestone of the Miroyedikha Formation. (d) Stylolitised and partially recrystallised intraclasts from the Miroyedikha Formation. (e) Coarse dolomitic spar filling inter-stromatolitic voids in the Miroyedikha Formation. (f) Fine-grained fabric-retentive dolomite (I) of the Lapa Formation (Vazante Group) surrounded by multiple stages (II, III, IV) of later dolomitic cements (>80 % by volume of the Lapa Formation consists of phase I dolomite). Figure S-2 Photomicrographs highlighting textural characteristics of the Angmaat Formation. A variety of primary depositional fabrics have been preserved through early dolomitisation, including evapourative features and tepee structures, a storm microbreccia, and microbial mats. Figure S-3 Geochemical indicators of diagenesis in all four sections. Circles are limestone and squares are dolostone. Bolded points represent samples that were excluded from further discussion based on diagenetic criteria. Blue = Turukhansk, red = Angmaat, tan = El Mreiti, and green = Vazante. Figure S-4 Cross-plots of raw Cr-isotope values vs. other detrital indicators (Ti and Zr). Dashed lines represent 10 ppm Ti and 1 ppm Zr, which seem to be the cutoff values above which detrital Cr masks the authigenic Cr-isotope signal. Figure S-5 Cross-plot of raw Cr-isotope values and O-isotopes indicating that lower O-isotope values (potentially indicating diagenesis) correspond to unfractionated Cr-isotope values. This could mean that diagenetic alteration (at least in the case of the Vazante Group) has the potential to reset Cr-isotopes to crustal values. Table S-1 Sample information, mineralogy, Cr-isotope, and Al concentration data for carbonates from the Turukhansk Uplift, Vazante and El Mreiti groups, and the Angmaat Formation (~1.1 to 0.9 Ga). Table S-2 δ13C, δ18O, major and trace element data, as well as sedimentary environments for the Turukhansk Uplift, Vazante and El Mreiti groups, and the Angmaat Formation (~1.1 to 0.9 Ga). Schoenberg, S., Zink, M., Staubwasser, M., von Blanckenburg, F. (2008) The stable Cr isotope inventory of solid Earth reservoirs determine by double spike MC-ICP-MS. Chemical Geology 249, 294-306. Bonnand, P., James, R.H., Parkinson, I.J., Connelly, D.P., Fairchild, I.J. (2013) The chromium isotopic composition of seawater and marine carbonates. Earth and Planetary Science Letters 382, 10-20. Scheiderich, K., Amini, M., Holmden, C., Francois, R. (2015) Global variability of chromium isotopes in seawater demonstrated by Pacific, Atlantic, and Arctic Ocean samples. Earth and Planetary Science Letters 423, 87-97. Frei, R., Crowe, S.A., Bau, M., Polat, A., Fowle, D.A., Døssing, L.N. (2016) Oxidative elemental cycling under the low O2 Eoarchean atmosphere. Scientific Reports 6, 21058. Planavsky, N.J., Reinhard, C.T., Wang, X., Thomson, D., McGoldrick, P., Rainbird, R.H., Johnson, T., Fischer, W.W., Lyons, T.W. (2014) Low mid-Proterozoic atmospheric oxygen levels and the delayed rise of animals. Science 346, 635-638. Crowe, S.A., Døssing, L.N., Beukes, N.J., Bau, M., Kruger, S.J., Frei, R., Canfield, D.E. (2013) Atmospheric oxygenation three billion years ago. Nature 501, 535-538. ). Because the delivery of positively fractionated Cr(VI) to seawater is dependent on a threshold level of atmospheric oxygen, the Cr-isotope composition of seawater through time – as recorded in marine sedimentary rocks – can serve as a sensitive indicator of ancient atmospheric pO2. This is particularly useful for testing hypotheses about atmospheric oxygenation during the Proterozoic Eon, where fundamental questions persist about the O2 content of Earth’s atmosphere and its relationship to temporal patterns of biological innovation. Lyons, T.W., Reinhard, C.T., Planavsky, N.J. (2014) The rise of oxygen in Earth’s early ocean and atmosphere. Nature 506, 307-315. ). Two first-order oxygen pulses have been identified from the Proterozoic geologic record. During the Great Oxidation Event (GOE) at ~2.4 Ga, pO2 was sustained above 10-5 PAL for the first time in Earth history, although transient ‘whiffs’ of O2 have been recognised from the Archaean geochemical record. During a subsequent Neoproterozoic oxygenation event (NOE) at ~635-550 Ma, pO2 began to rise to near-modern levels – a transition that continued into the Palaeozoic Era. Butterfield, N.J. (2009) Oxygen, animals and oceanic ventilation: an alternative view. Geobiology 7, 1-7. Zhang, S., Wang, X., Wang, H., Bjerrum, C.J., Hammarlund, E.U., Mafalda Costa, M., Connelly, J.N., Zhang, B., Su, J., Canfield, D.E. (2016) Sufficient oxygen for animal respiration 1,400 million years ago. Proceedings of the National Academy of Sciences USA 113, 1731-1736. Mills, D.B., Ward, L.M., Jones, C., Sweeten, B., Forth, M., Treusch, A.H., Canfield, D.E. (2014) Oxygen requirements of the earliest animals. Proceedings of the National Academy of Sciences USA 111, 4168-4172. Frei, R., Gaucher, C., Poulton, S.W., Canfield, D.E. (2009) Fluctuations in Precambrian atmospheric oxygenation recorded by chromium isotopes. Nature 461, 250-253. ). Iron-rich rocks are rare in mid-Proterozoic successions, however, limiting our ability to generate data for the crucial period preceding the NOE. Pereira, N.S., Voegelin, A.R., Paulukat, C., Sial, A.N., Ferreira, V.P., Frei, R. (2016) Chromium-isotope signatures in scleractinian corals from the Rocas Atoll, Tropical South Atlantic. Geobiology 14, 54-67. Mohanta, J., Holmden, C., Blanchon, P. (2016) Chromium isotope fractionation between seawater and carbonate sediment in the Caribbean Sea. Goldschmidt Abstracts, http://goldschmidt.info/2016/uploads/abstracts/finalPDFs/2121.pdf. Rodler, A., Sanchez-Pastor, N., Fernandez-Diaz, L., Frei, R. (2015) Fractionation behavior of chromium isotopes during coprecipitation with calcium carbonate: implications for their use as paleoclimatic proxy. Geochimica et Cosmochimica Acta 164, 221-235. ). In experiments with the lowest initial Cr concentration (8.6 ppm), precipitates were <0.1 ‰ heavier than the solution, suggesting that minimal fractionation occurs during chromate incorporation into calcite at low Cr concentrations typical of seawater (0.08 to 0.5 ppm). In this study, we measured the Cr-isotopic composition of marine limestone and dolostone from four geographically distinct mid-Proterozoic successions, along with a suite of major and trace elements to constrain diagenetic pathways and the influence of detrital contamination. We focused on the interval between ~1.1 and 0.9 Ga – where sea level highstand resulted in marine carbonate deposition across multiple cratons – and a variety of depositional environments to assess the consistency and reliability of the proxy. Samples were carefully selected based on known criteria for identifying diagenetic alteration and detrital contamination, and our data are ultimately used to provide important new constraints on atmospheric pO2 during the mid-Proterozoic Eon. Samples were analysed from the Turukhansk Uplift, Siberia (~900-1035 Ma), the Angmaat Formation, Canada (~1092 Ma), the El Mreiti Group, Mauritania (~1107 Ma), and the Vazante Group, Brazil (~1112 Ma). Cr-isotope and Cr concentration measurements were performed on a thermal ionisation mass spectrometer. Ca, Mg, Fe, Sr, Mn, and Al concentrations were measured by ICP-OES, and Ti and Zr concentrations were measured by ICP-MS (see Supplementary Information). Banner, J.L., Hanson, G.N. (1990) Calculation of simultaneous isotopic and trace element variations during water-rock interaction with applications to carbonate diagenesis. Geochimica et Cosmochimica Acta 54, 3123-3137. Kaufman, A.J., Knoll, A.H. (1995) Neoproterozoic variations in the C-isotopic composition of seawater: stratigraphic and biogeochemical implications. Precambrian Research 73, 27-49. Bartley, J.K., Kah, L.C., McWilliams, J.L., Stagner, A.F. (2007) Carbon isotope chemostratigraphy of the Middle Riphean type section (Avzyan Formation, Southern Urals, Russia): signal recovery in a fold-and-thrust belt. Chemical Geology 237, 211-232. Kah, L.C., Bartley, J.K., Teal, D.A. (2012) Chemostratigraphy of the late Mesoproterozoic Atar Group, Taoudeni Basin, Mauritania: muted isotopic variability, facies correlation, and global isotopic trends. Precambrian Research 200-203, 82-103. ), conservatively excluding outliers that are depleted in 18O, substantially enriched in Mn, or depleted in Sr (Fig. S-3). We interpret our Cr-isotope data within the context of these standard criteria, acknowledging that additional work is necessary specifically to explore Cr behaviour during carbonate diagenesis. Detailed mineralogical, textural, and geochemical information can be found in the Supplementary Information. Wedepohl, K.H. (1991) The composition of the upper Earth’s crust and the natural cycles of selected metals. In: Merian, E. (Ed.) Metals and their compounds in the environment: occurrence, analysis, and biological relevance. VCH, Weinheim, New York, Basel, Cambridge, 3-17.
) – which serves as a first-order proxy for clay-rich detrital sediment – to derive a rough estimate of the fraction of Cr sourced from detrital material for each sample. Similarly, positively fractionated δ53Cr is only recorded in samples where less than ~35 % of measured Cr is detritally sourced (Fig. 1b). These trends represent a mixing curve where Cr in the carbonate lattice is dissolved and analysed in addition to Cr leached from clay. When detrital Cr exceeds ~35 % of total measured Cr, δ53Cr values approach average crust (–0.12 ‰) and the isotopic composition of the authigenic seawater component is unresolvable. When samples have less than ~35 % detrital Cr, we can perform a basic correction of raw δ53Cr values, assuming the detrital component has a crustal δ53Cr value. This yields a first-order estimate of the isotopic composition of the authigenic Cr component (δ53Crauth), which is thought to be derived from seawater (see Supplementary Information). After exclusion of samples based on diagenetic and detrital contamination criteria, our dataset consisted of 62 samples that cover all four successions. These methods for assessing detrital Cr contamination represent a new set of best practices that should be applied in future Cr-isotope studies of carbonate rocks. , then our dataset provides even stronger evidence for positively fractionated Cr in mid-Proterozoic seawater, assuming that carbonates are able to retain their original δ53Cr signature. ), leading to the suggestion that low pO2 inhibited Cr-isotope fractionation during the mid-Proterozoic Eon. Here we extend the mid-Proterozoic record of positively fractionated Cr back to ~1.1 Ga – a revision of ~350 Ma from previous estimates (Fig. 2). Kah, L.C., Lyons, T.W., Chesley, J.T. (2001) Geochemistry of a 1.2 Ga carbonate-evaporite succession, northern Baffin and Bylot Islands: implications for Mesoproterozoic marine evolution. Precambrian Research 111, 203-234. Johnston, D.T., Wing, B.A., Farquhar, J., Kaufman, A.J., Strauss, H., Lyons, T.W., Kah, L.C., Canfield, D.E. (2005) Active microbial sulfur disproportionation in the Mesoproterozoic. Science 310, 1477-1479. Parnell, J., Boyce, A.J., Mark, D., Bowden, S., Spinks, S. (2010) Early oxygenation of the terrestrial environment during the Mesoproterozoic. Nature 468, 290-293. Liu, X.M., Kah, L.C., Knoll, A.H., Cui, H., Kaufman, A.J., Shahar, A., Hazen, R.M. (2016) Tracing Earth’s O2 evolution using Zn/Fe ratios in marine carbonates. Geochemical Perspectives Letters 2, 24-34.
, however, this would be expected to generate a range of δ53Cr values – not the persistently unfractionated values that were measured. Another alternative is that mid-Proterozoic pO2 was variable around the threshold required for Cr-isotope fractionation. There is evidence for this in our dataset – the persistence of unfractionated δ53Cr values that are not related to detrital contamination (Fig. 1) could be related to transient periods of pO2 below threshold values. Indeed the only measured iron oolites that temporally overlap with samples from this study are limited samples from the ~0.9 Ga Aok Formation (Canada), implying that the coarse temporal resolution of current data may be insufficient to track short-term variability in pO2. Taken together with the full range of published proxy data, we conclude that mid-Proterozoic pO2 was likely more dynamic than previously envisaged. Sperling, E.A., Halverson, G.P., Knoll, A.H., Macdonald, F.A., Johnston, D.T. (2013a) A basin redox transect at the dawn of animal life. Earth and Planetary Science Letters 371-372, 143-155. Erwin, D.H., Laflamme, M., Tweedt, S.M., Sperling, E.A., Pisani, D., Peterson, K.J. (2011) The Cambrian conundrum: early divergence and later ecological success in the early history of animals. Science 334, 1091-1097. Sperling, E.A., Frieder, C.A., Raman, A.V., Girguis, P.R., Levin, L.A., Knoll, A.H. (2013b) Oxygen, ecology, and the Cambrian radiation of animals. Proceedings of the National Academy of Sciences USA 110, 13446-13451. ). Based on these considerations it seems that, although the oxygen requirements of small, simple animals were likely met by ~1.1 Ga, low atmospheric pO2 may still have inhibited the development of larger, more energetic animals that have greater preservation potential in the fossil record. This study demonstrates the viability of the Cr-isotope palaeo-redox proxy as it is applied to ancient carbonate rocks. After screening for detrital contamination – and assuming that our least-altered samples are able to retain original δ53Cr values – Cr-isotope data can be interpreted in the context of ancient atmospheric pO2. Results from four carbonate successions extend the mid-Proterozoic record of positively fractionated Cr back to ~1.1 Ga – a revision of ~350 Ma from previous estimates. If we take 0.1 to 1 % PAL as the pO2 threshold needed for Cr-isotope fractionation, then our data suggest that the oxygen requirements of small, simple animals were at least transiently met well prior to their Neoproterozoic appearance, although uncertainty regarding this pO2 threshold precludes definitive biological interpretation. Ultimately, the development of novel carbonate-based redox proxies has the potential to greatly enhance the temporal resolution of palaeo-redox data for the Proterozoic Eon. This work was supported by grants from the Danish Natural Science Research Council (FNU) to R.F. and the Carlsberg Foundation to G.J.G. and R.F. A.H.K. thanks the NASA Astrobiology Institute and G.J.G. thanks Ariel Anbar and the NASA Postdoctoral Program. 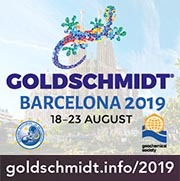 We are indebted to Toni Larsen for help in ion chromatographic separation of Cr, Toby Leeper for mass spectrometry support, Jørgen Kystol for running the ICP-MS, and Andrea Voegelin for major contributions to Cr-isotope analytical and data interpretation techniques. We also thank Clemens V. Ullmann for ICP-OES expertise and insightful comments on an earlier draft of this manuscript. We then compared isotopic and trace element trends that are sensitive to fluid interaction (e.g., δ18O, [Sr], [Mn]; Banner and Hanson, 1990) to values recorded across a range of preservation states within Proterozoic carbonates (e.g., Kaufman and Knoll, 1995; Bartley et al., 2007; Kah et al., 2012), conservatively excluding outliers that are depleted in 18O, substantially enriched in Mn, or depleted in Sr (Fig. S-3). Cr(VI) (dominantly as chromate; CrO4-) is then carried to the oceans via rivers, thus imparting a positively fractionated δ53Cr signal on modern seawater (+0.41 to +1.55 ‰ compared to crustal values of –0.123 ± 0.102 ‰) (Schoenberg et al., 2008; Bonnand et al., 2013; Scheiderich et al., 2015). Some argue that exceedingly low mid-Proterozoic pO2 was a direct impediment to metazoan evolution prior to the Neoproterozoic Era (Planavsky et al., 2014), whereas others argue that oxygen levels required by early animals were in place long before their Neoproterozoic appearance (Butterfield, 2009; Zhang et al., 2016). Kinetic considerations dictate, however, that 0.1 to 1 % PAL is necessary to oxidise Cr(III) within typical soil residence times (Planavsky et al., 2014) and between 0.03 and 0.3 % PAL is necessary to export Cr without re-reduction by Fe(II) (Crowe et al., 2013). If we take 0.1 to 1 % PAL as the threshold required for Cr-isotope fractionation, then our data suggest that pO2 levels sufficient for the origin of animals were at least transiently in place by ~1.1 Ga - some 300 Ma before the origin of sponges based on molecular clock estimates (Erwin et al., 2011) and >450 Ma before the first appearance of animals in the fossil record. Ironstone and iron formation data have thus far provided important constraints on Archaean ‘whiffs’ of oxygen and the subsequent GOE, as well as new clues about the NOE (Frei et al., 2009). Banded iron formations from the Archaean-Proterozoic transition record pulses of terrestrial Cr-oxidation prior to the GOE and a lack of Cr-isotope fractionation immediately following the GOE, which is interpreted as a post-GOE decline in atmospheric pO2 (Frei et al., 2009). Frei et al. (2016) suggested that Cr-oxidation by Mn-oxides is thermodynamically possible at pO2 as low as 10-5 of the present atmospheric level (PAL). The record of positively fractionated Cr in seawater has recently been extended back to ~3.8 Ga, which Frei et al. (2016) interpret as terrestrial Cr-oxidation under an otherwise anoxic Archaean atmosphere. These data are consistent with a broad range of proxies that suggest increasing biospheric oxygen in the Mesoproterozoic Era (Kah et al., 2001; Johnston et al., 2005; Parnell et al., 2010; Zhang et al., 2016). Data are potentially inconsistent, however, with recent estimates of maximum pO2 between 0.1 and 1 % PAL during the mid-Proterozoic Eon, including Cr-isotope data from sparse mid-Proterozoic iron oolites (Planavsky et al., 2014; Liu et al., 2016). If we take 0.03 % PAL as the required threshold, for example, our data become compatible with the pO2 estimate of Liu et al. (2016) based on carbonate Zn/Fe systematics. The oxygenation of Earth surface environments was a protracted process that occurred over >2 billion years (Ga) (see Lyons et al., 2014). Mid-Proterozoic Cr-isotope data have the potential to inform this debate because estimates of the pO2 threshold needed for Cr-isotope fractionation are roughly similar to experimental and theoretical estimates of the O2 requirements of early animals (0.3 to 4 % PAL) (e.g., Mills et al., 2014). Tank experiments have shown that sponges can survive when pO2 is as low as 0.5 to 4 % PAL, leading Mills et al. (2014) to conclude that this level was likely sufficient for the origin of animals. Mohanta et al. (2016) showed that modern bulk biogenic carbonate is as much as 0.45 ‰ lighter than seawater. Additionally, if carbonate preferentially incorporated 52Cr as observed by Mohanta et al. (2016), then our dataset provides even stronger evidence for positively fractionated Cr in mid-Proterozoic seawater, assuming that carbonates are able to retain their original δ53Cr signature. This discrepancy cannot be explained by Cr-isotope fractionation during carbonate formation, particularly if carbonates preferentially incorporate 52Cr (Mohanta et al., 2016), which would only amplify evidence for positively fractionated Cr in mid-Proterozoic seawater. Studies of modern invertebrate shells reveal that Cr-isotope fractionation does occur during biomineralisation, making skeletal carbonates an unreliable archive of seawater δ53Cr values (Pereira et al., 2016). Sparse ironstone data from the mid-Proterozoic suggest a lack of Cr-isotope fractionation (Planavsky et al., 2014). Subsequent evidence for Cr-isotope fractionation was not found until ~750 Ma (Planavsky et al., 2014), leading to the suggestion that low pO2 inhibited Cr-isotope fractionation during the mid-Proterozoic Eon. If we take soil residence time calculations (~0.1 to 1 % PAL; Planavsky et al., 2014) as our best estimate, we conclude that pO2 at least transiently exceeded ~0.1 to 1 % PAL during the mid-Proterozoic Eon. As articulated by Planavsky et al. (2014), however, this would be expected to generate a range of δ53Cr values - not the persistently unfractionated values that were measured. Co-precipitation experiments involving chromate incorporation into calcite have shown, however, that abiogenic carbonate has the potential to record δ53Cr values of the ambient solution (Rodler et al., 2015). The maximum isotopic difference observed by Rodler et al. (2015) between synthetic calcite and ambient solution was 0.33 ‰ so that, even if some fractionation did occur during carbonate formation, the preponderance of strongly positive δ53Cr values in our dataset (n = 24 samples >0.3 ‰) indicates that mid-Proterozoic seawater was positively fractionated. Based on theoretical early annelid body plans, a small worm with a circulatory system could likely survive at pO2 as low as 0.14 % PAL (Sperling et al., 2013a). Ecological considerations are also important and modern oxygen minimum zones suggest that there is a clear linkage between oxygen availability, animal size, and the relative proportion of carnivorous taxa (Sperling et al., 2013b). Assuming that Al is the most effective indicator of clay contamination, we compared sample Cr/Al ratios to an average shale composite (Cr = 90 ppm; Al = 8.89 wt. %; Wedepohl, 1991) - which serves as a first-order proxy for clay-rich detrital sediment - to derive a rough estimate of the fraction of Cr sourced from detrital material for each sample. Petrov, P.Y., Semikhatov, M.A. (1997) Structure and environmental conditions of a transgressive Upper Riphean complex: Miroyedikha Formation of the Turukhansk Uplift, Siberia. Lithology and Mineral Resources 32, 11-29. Petrov, P.Y., Semikhatov, M.A. (1998) The upper Riphean stromatolitic reefal complex; Burovaya Formation of the Turukhansk region, Siberia. Lithology and Mineral Resources 33, 539-560. Sergeev, V.N. (2001) Paleobiology of the Neoproterozoic (Upper Riphean) Shorikha and Burovaya silicified microbiotas, Turukhansk Uplift, Siberia. Journal of Paleontology 75, 427-448. Petrov, P.Y. (1993a) Depositional environments of the lower formations of the Riphean sequence, northern part of the Turukhansk Uplift, Siberia. Stratigraphy and Geological Correlation 1, 181-191. Veis, A.F., Petrov, P.Y. (1994) The main peculiarities of the environmental distribution of microfossils in the Riphean basins of Siberia. Stratigrarphy and Geological Correlation 2, 97-129. Petrov, P.Y. (1993b) Structure and sedimentation environments of the Riphean Bezymyannyi Formation in the Turukhansk Uplift, Siberia. Stratigraphy and Geological Correlation 1, 490-502. Petrov, P.Y., Semikhatov, M.A., Sergeev, V.N. (1995) Development of the Riphean carbonate platform and distribution of silicified microfossils: the Sukhaya Tunguska Formation, Turukhansk Uplift, Siberia. Stratigraphy and Geological Correlation 3, 602-620. Sergeev, V.N., Knoll, A.H., Petrov, P.Y. (1997) Paleobiology of the Mesoproterozoic-Neoproterozoic transition: the Sukhaya Tunguska Formation, Turukhansk Uplift, Siberia. Precambrian Research 85, 201-239. Ovchinnikova, G.V., Gorokhov, I.M., Belyatskii, B.V. (1995) U-Pb systematics of Pre-Cambrian carbonates: the Riphean Sukhaya Tunguska Formation in the Turukhansk Uplift, Siberia. Lithology and Mineral Resources 30, 525–536. Bartley, J.K., Semikhatov, M.A., Kaufman, A.J., Knoll, A.H., Pope, M.C., Jacobsen, S.B. (2001) Global events across the Mesoproterozoic-Neoproterozoic boundary: C and Sr isotopic evidence from Siberia. Precambrian Research 111, 165-202. Kah, L.C., Sherman, A.B., Narbonne, G.M., Kaufman, A.J., Knoll, A.H. (1999) d13C stratigraphy of the Proterozoic Bylot Supergroup, northern Baffin Island: implications for regional lithostratigraphic correlations. 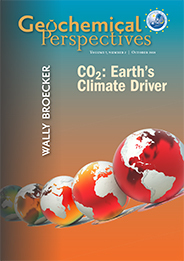 Canadian Journal of Earth Sciences 36, 313-332. Gilleaudeau, G.J., Kah, L.C. (2013a) Carbon isotope records in a Mesoproterozoic epicratonic sea: carbon cycling in a low-oxygen world. Precambrian Research 228, 85-101. ), but have not been subjected to regional or contact metamorphism. Outcrop samples were collected during a joint US-Russian field expedition in 1995 (near the confluence of the Yenisei and Nizhnyaya Tunguska Rivers; ~65.8° N, 87.9° E) and samples were accessed from the archives of the Botanical Museum at Harvard University. Turner, E.C., Kamber, B.S. (2012) Arctic Bay Formation, Borden Basin, Nunavut (Canada): Basin evolution, black shale, and dissolved metal systematics in the Mesoproterozoic ocean. Precambrian Research 208-211, 1-18. Heaman, L.M., LeCheminant, A.N., Rainbird, R.H. (1992) Nature and timing of Franklin igneous events, Canada: implications for a late Proterozoic mantle plume and the break-up of Laurentia. Earth and Planetary Science Letters 109, 117-131. ), which have not influenced the sections examined in this study. Outcrop samples were collected during a series of field expeditions in the mid-1990’s in northernmost Baffin Island, Canada (~72.2° N, 79.5° E for the White Bay outcrop section) and samples were accessed from the archives of the Botanical Museum at Harvard University. Gilleaudeau, G.J., Kah, L.C. (2013b) Oceanic molybdenum drawdown by epeiric sea expansion in the Mesoproterozoic. Chemical Geology 356, 21-37. Gilleaudeau, G.J., Kah, L.C. (2015) Heterogeneous redox conditions and a shallow chemocline in the Mesoproterozoic ocean: evidence from carbon-sulfur-iron relationships. Precambrian Research 257, 94-108. Bertrand-Sarfati, J., Moussine-Pouchkine, A. (1988) Is cratonic sedimentation consistent with available models? An example from the Upper Proterozoic of the West African craton. Sedimentary Geology 58, 255-276. Benan, C.A.A., Deynoux, M. (1998) Facies analysis and sequence stratigraphy of Neoproterozoic platform deposits in Adrar of Mauritania, Taoudeni Basin, West Africa. Geologische Rundschau 87, 283-330. Rooney, A.D., Selby, D., Houzay, J.P., Renne, P.R. (2010) Re - Os geochronology of a Mesoproterozoic sedimentary succession, Taoudeni Basin, Mauritania: implications for basin-wide correlations and Re - Os organic-rich sediments systematics. Earth and Planetary Science Letters 289, 486-496. ). Fresh core samples were collected from drill core F4 that intersected the Khatt, En Nesoar, Touirist, Aguelt el Mabha, and Gouamir formations just west of El Mreiti, Mauritania (~23.5° N, 7.85° W). Azmy, K., Veizer, J., Misi, A., de Oliveira, T.F., Sanches, A.L., Dardenne, M.A. (2001) Dolomitization and isotope stratigraphy of the Vazante Formation, São Francisco Basin, Brazil. Precambrian Research 112, 303-329. Geboy, N.J., Kaufman, A.J., Walker, R.J., Misi, A., de Oliveira, T.F., Miller, K.E., Azmy, K., Kendall, B., Poulton, S.W. (2013) Re-Os constraints and new observations of Proterozoic glacial deposits in the Vazante Group, Brazil. Precambrian Research 238, 199-213. Azmy, K., Kendall, B., Creaser, R.A., Heaman, L., de Oliveira, T.F. (2008) Global correlation of the Vazante Group, São Francisco Basin, Brazil: Re-Os and U-Pb radiometric age constraints. Precambrian Research 164, 160-172. Olcott, A.N., Sessions, A.L., Corsetti, F.A., Kaufman, A.J., de Oliveira, T.F. (2005) Biomarker evidence for photosynthesis during Neoproterozoic glaciation. Science 310, 471-474. Azmy, K., Sylvester, P., de Oliveira, T.F. (2009) Oceanic redox conditions in the Late Mesoproterozoic recorded in the upper Vazante Group carbonates of the São Francisco Basin, Brazil: evidence from stable isotopes and REEs. Precambrian Research 168, 259-270.
) and evidence for contact metamorphism is absent in the study area. Fresh core samples were collected from drill cores CMM-500, CMM-279, and MASW-01 that intersected the Serra do Poco Verde, Morro do Calcario, and Lapa formations northwest of Unaí, Brazil (~16.3° S, 47.1° W). Outcrop and drill core samples were first slabbed using a diamond saw in order to remove weathered surfaces. Slabs were then washed in 2 M HCl to etch the surfaces that had been in contact with the saw blade. Next, slabs were wrapped in plastic and crushed to chips manually with a hammer, with the plastic wrapping designed to avoid contact of samples with the hammer. Lastly, rock chips were crushed to a fine powder using an agate mixer mill. Frei, R., Gaucher, C., Døssing, L.N., Sial, A.N. (2011) Chromium isotopes in carbonates - a tracer for climate change and for reconstructing the redox state of ancient seawater. Earth and Planetary Science Letters 312, 114-125.
) to a 4:1 sample to spike Cr ratio. Spiked samples were then dissolved for ~30 minutes in either 0.5 M or 2 M HCl with the sample mixed through the acid using a shaker table. After dissolution, samples were centrifuged to remove insoluble residue and the supernatant was pipetted into a Teflon beaker that was pre-cleaned with aqua regia. Teflon beakers were placed uncovered on a hot plate and the supernatant was dried down overnight at 120 °C. Next, the sample was re-dissolved in aqua regia (made from double-distilled HCl and HNO3) and, again, dried down overnight at 120 °C to ensure sample/spike homogenisation. Samples were then re-dissolved in 0.1 M HCl, and ~1 mL of (NH4)S2O8 was added to each beaker as an oxidising agent. Beakers were capped and heated in a microwave for ~30 minutes (or until boiling was observed) to oxidise Cr(III) to Cr(VI). Oxidised samples were then passed over an anion exchange column charged with 2 mL of Dowex AG 1 × 8 anion resin (100-200 mesh, pre-conditioned with 6 M HCl), during which Cr(VI)-oxyanions are adsorbed to the resin surface by exchange with chloride ions. Cr was then released from the anion resin by reduction to Cr(III) using 2 M double-distilled HNO3 and H2O2. The resulting liquid was dried down overnight at 120 °C and the sample was re-dissolved in 1 mL of 6 M double-distilled HCl before being passed over a second anion exchange column – also charged with 2 mL of Dowex AG 1 × 8 anion resin (100-200 mesh, pre-conditioned with 6 M HCl) – designed specifically for removal of iron (Fe). Fe removal is critical because of isobaric interference between 54Fe and 54Cr during isotopic analysis. Again, the resulting liquid was dried down overnight at 120 °C and samples were re-dissolved in 200 μL of 6 M double-distilled HCl. After dilution with 2.2 mL of ultrapure MQ water, samples were passed over a cation exchange column charged with 2 mL of Dowex AG50W-X8 cation resin (200-400 mesh, pre-conditioned with 0.5 M HCl). Cation exchange is used to separate Cr from major matrix elements such as Ca, Mg, Mn, Al, and residual Fe. The resulting liquid was dried down overnight at 120 °C and the precipitate was then ready for loading onto a Re filament for Cr-isotopic analysis. Standard errors for our samples were consistently <0.05 ‰. Initial sample and spike weights were also used to determine the Cr concentration of each sample (in ppm) from TIMS data. Blanks produced consistently <15 ng of Cr, which is negligible compared to our samples that contained between ~500 ng and 6 μg of Cr. Ca, Mg, Fe, Sr, Mn, and Al concentrations were measured by ICP-OES at the University of Copenhagen on splits of the same sample solutions used for Cr-isotopic analysis. Solutions were diluted with 2 % HNO3 to a Ca concentration of ~50 ppm, and limestone and dolostone samples were analysed separately along with three separate calibration solutions designed to mimic the range of element concentrations expected in limestone and dolostone samples. Duplicates of certified carbonate standards (JLs-1 and JDo-1) were measured every nine samples and analytical precision was determined using the reproducibility of molar element to Ca ratios in the standards. Measured values are in good agreement with published values for both JLs-1 and JDo-1. The sum of cation concentrations relative to initial sample weight was used to determine the carbonate content of each sample. Carbonate content was then used to correct measured concentrations of Ca, Mg, Fe, Sr, and Mn to reflect concentrations specifically in carbonate. Ti and Zr abundances were measured by ICP-MS at the Geological Survey of Denmark and Greenland (GEUS). 25-35 mg of sample powder was dissolved in 2 mL of either 0.5 M or 2 M HCl and final solutions were diluted up to 10 mL with ultrapure MQ water. Samples were analysed using the USGS BHVO-1 (basalt, Hawaiian Volcanic Observatory) standard as a reference material along with dissolved carbonate standards (JLs-1 and JDo-1). Measured Ti and Zr concentrations for the BHVO-1 standard are in good agreement with published values. Longman, M.W. (1980) Carbonate diagenetic textures from near surface diagenetic environments. AAPG Bulletin 64, 461-487. Reid, R.P., Macintyre, I.G. (1998) Carbonate recrystallization in shallow marine environments: a widespread diagenetic process forming micritized grains. Journal of Sedimentary Research 68, 928-946. Tucker, M.E. (1983) Diagenesis, geochemistry, and origin of a Precambrian dolomite: the Beck Spring Dolomite of eastern California. Journal of Sedimentary Petrology 53, 1097-1119. Nicholas, C.J. (1996) The Sr isotopic evolution of the oceans during the ‘Cambrian Explosion’. Journal of the Geological Society of London 153, 243-254. ). By contrast, dolomite formed during deep burial diagenesis (or in contact with hydrothermal fluids) commonly obliterates primary textural characteristics, replacing them with coarse, euhedral or saddle dolomite (i.e. fabric-destructive dolomitisation).
) that the flooding surface marking the base of the Touirist Formation served as a conduit for later fluid flow that affected carbonate preservation in the En Nesoar and basal Touirist formations. Samples from this stratigraphic interval are excluded from further consideration. Knoll, A.H., Kaufman, A.J., Semikhatov, M.A. (1995) The carbon-isotopic composition of Proterozoic carbonates: Riphean successions from northwestern Siberia (Anabar Massif, Turukhansk Uplift). American Journal of Science 295, 823-850. ), resulting in pervasive clotted micritic fabrics similar to well-preserved intervals of the Miroyedikha Formation (Fig. S-1c). Coarse competitive-growth dolomite cements are observed in some samples, but overall they comprise <10 % of the rock by volume. ), however, and have been visually avoided for sampling in this study. In the Angmaat Formation, fabric retentive dolomitisation during early diagenesis has preserved a range of primary textures (Fig. S-2). These include storm microbreccias and evaporative structures (tepee structures and gypsum pseudomorphs), as well as a range of microbial fabrics, including finely laminated and tufted mats, along with clotted microbialites. Dolomite crystal sizes range from micrite to microspar with no evidence for coarse recrystallisation during later diagenesis, aside from occasional void-filling cements that were avoided for sampling in this study. Figure S-2 Photomicrographs highlighting textural characteristics of the Angmaat Formation. A variety of primary depositional fabrics have been preserved through early dolomitisation, including evaporative features and tepee structures, a storm microbreccia, and microbial mats. Dorobek, S.L. (1987) Petrography, geochemistry, and origin of burial diagenetic facies, Siluro-Devonian Helderberg Group (carbonate rocks), central Appalachians. AAPG Bulletin 71, 492-514. ), providing a benchmark by which to assess the preservation of our samples. Ullmann, C.V., Korte, C. (2015) Diagenetic alteration in low-Mg calcite from macrofossils: a review. Geological Quarterly 59, 3-20. Vahrenkamp, V.C., Swart, P.K. (1990) New distribution coefficient for the incorporation of strontium into dolomite and its implications for the formation of ancient dolomites. Geology 18, 387-391. Mazzullo, S.J. (1992) Geochemical and neomorphic alteration of dolomite: a review. Carbonates and Evaporites 7, 21-37.
) than calcite. As a result, we emphasise the recognition of diagenetic trends within carbonate trace element data instead of the use of absolute cutoffs for sample inclusion. ; Fig. S-3) are also consistent with petrographic evidence for late, fabric-destructive dolomitisation, supporting our exclusion of these samples from further consideration. Figure S-3 Geochemical indicators of diagenesis in all four sections. Circles are limestone and squares are dolostone. Bold points represent samples that were excluded from further discussion based on diagenetic criteria. Blue = Turukhansk, red = Angmaat, tan = El Mreiti, and green = Vazante. In the Turukhansk Uplift succession, limestone of the Linok, Sukhaya Tunguska, and Burovaya formations has Mn/Sr ratios <1.5 and δ18O values typical of well-preserved Proterozoic limestone (generally –6 to –10 ‰; Fig. S-3) – consistent with petrographic observations of primarily micritic phases. 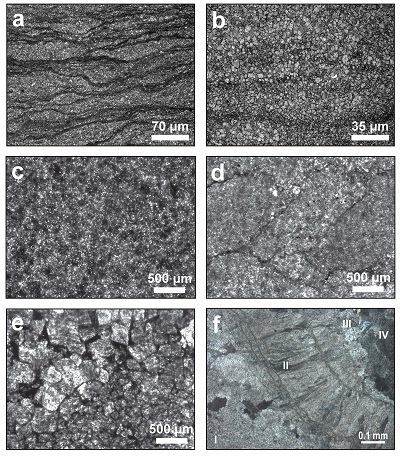 Limestone of the Miroyedikha Formation has undergone varying degrees of recrystallisation and those samples with obvious petrographic evidence for recrystallisation (Fig. S-1) also have anomalously high Mn/Sr ratios (>85), supporting our exclusion of these samples. In the Turukhansk Formation, there is a tight range of Mn/Sr ratios <8.5 and δ18O values between –6 and –8.5 ‰ (Fig. S-3), which is consistent with early fabric-retentive dolomitisation. In the Vazante Group, isotopic and elemental trends suggest the potential for some later diagenetic alteration despite the dominance of micritic fabrics throughout the succession. A cross-plot of δ13C vs. δ18O values (Fig. S-3) reveals some samples that are depleted in both 13C and 18O relative to the rest of the succession. These samples also sometimes exhibit elevated Mn/Sr ratios (>10), prompting us to exclude these samples from further consideration based on two independent lines of geochemical evidence. ). Thus, the oxygen isotope signature of Angmaat Formation dolostones is not taken as evidence for late diagenetic alteration. In total, 17 samples were excluded based on petrographic and geochemical signs of diagenetic alteration. The remaining samples fit all standard criteria for well-preserved carbonate and we emphasise that isotopic and trace element signatures mimic petrographic observations, thus providing multiple independent lines of evidence that support our criteria for sample inclusion.
) demonstrated stratigraphic δ53Cr trends that mirror primary δ13C trends across a mixed limestone-dolostone interval. Because the C-isotope signal is thought to reflect seawater, co-variation with δ53Cr speaks to the potential fidelity of Cr-isotopes in both limestone and dolostone and suggests that, in the absence of further study on Cr-isotope behaviour during diagenesis, standard petrographic and geochemical criteria can be used as a starting point for Cr-isotope diagenetic screening. Taylor, S.R., McLennan, S.M. (1985) The continental crust: its composition and evolution. Blackwell Scientific Publications, Palo Alto, CA, 312 pp. , but found <2 % differences in estimates of detrital Cr contribution and <0.02 ‰ differences in corrected δ53Crauth values. ), influencing the degree of in situ Cr-reduction. *δ13C and δ18O data previously published for the Turukhansk Uplift (Bartley et al., 2001 Bartley, J.K., Semikhatov, M.A., Kaufman, A.J., Knoll, A.H., Pope, M.C., Jacobsen, S.B. (2001) Global events across the Mesoproterozoic-Neoproterozoic boundary: C and Sr isotopic evidence from Siberia. Precambrian Research 111, 165-202. ), Vazante Group (Azmy et al., 2001 Azmy, K., Veizer, J., Misi, A., de Oliveira, T.F., Sanches, A.L., Dardenne, M.A. (2001) Dolomitization and isotope stratigraphy of the Vazante Formation, São Francisco Basin, Brazil. Precambrian Research 112, 303-329. ), El Mreiti Group (Gilleaudeau and Kah, 2013a Gilleaudeau, G.J., Kah, L.C. (2013a) Carbon isotope records in a Mesoproterozoic epicratonic sea: carbon cycling in a low-oxygen world. Precambrian Research 228, 85-101. ), and Angmaat Formation (Kah et al., 1999 Kah, L.C., Sherman, A.B., Narbonne, G.M., Kaufman, A.J., Knoll, A.H. (1999) d13C stratigraphy of the Proterozoic Bylot Supergroup, northern Baffin Island: implications for regional lithostratigraphic correlations. Canadian Journal of Earth Sciences 36, 313-332. ). The Vazante Group - deposited along the western margin of the São Francisco craton (Minas Gerais, Brazil) - is comprised of dominantly dolomitic strata that reach up to 2 km in thickness in the eastern part of the Brasília Fold Belt (Azmy et al., 2001). The Vazante Group, the Serra do Poco Verde, Morro do Calcario, and Lapa formations are all characterised by uniformly micritic to microsparitic, fabric-retentive dolomite (Azmy et al., 2001) that precipitated during very early diagenesis (Fig. S-1f). Cement phases comprise <20 % of the rock by volume (Azmy et al., 2001), however, and have been visually avoided for sampling in this study. Table S-2 [...] *δ13C and δ18O data previously published for the Turukhansk Uplift (Bartley et al., 2001), Vazante Group (Azmy et al., 2001), El Mreiti Group (Gilleaudeau and Kah, 2013a), and Angmaat Formation (Kah et al., 1999). Above this lies the Serra do Poco Verde and Morro do Calcario formations, which consist of relatively pure dolostone with discrete silty intervals and microbial lamination deposited in supratidal to intertidal environments (Azmy et al., 2008). Re-Os geochronology on organic-rich diamictite horizons yields ages of 1100 ± 77 Ma (Azmy et al., 2008) and 1112 ± 50 Ma (Geboy et al., 2013), supporting a late Mesoproterozoic age for the Vazante Group. During the Brasiliano-Pan African orogeny, regional metamorphism did not exceed lowermost greenschist facies (Azmy et al., 2008) and evidence for contact metamorphism is absent in the study area. The base of the diamictite interval erosionally incises underlying strata, and in some cases, two separate diamictite intervals are observed (one at the top of the Serra do Poco Verde Formation), although these relationships seem to be regionally variable (Olcott et al., 2005; Azmy et al., 2009; Geboy et al., 2013). Both δ13C and δ18O can be altered by meteoric and/or burial diagenesis, with δ18O being more susceptible to alteration because the δ13C value of diagenetic fluids often becomes buffered to rock values (Banner and Hanson, 1990). The concentration of Sr, Fe, and Mn in the carbonate lattice can also be a sensitive monitor for diagenetic processes (Banner and Hanson, 1990; Ullmann and Korte, 2015). Pb-Pb geochronology on the Sukhaya Tunguska Formation yields an age of 1035 ± 60 Ma (Ovchinnikova et al., 1995), which is consistent with correlations to better-dated successions elsewhere in Siberia and muted carbon isotope variability (Bartley et al., 2001) that is characteristic of global carbon isotope trends in the late Mesoproterozoic Era (Kah et al., 1999, 2012; Gilleaudeau and Kah, 2013a). Turukhansk Uplift strata have been gently tilted (15-30°) by regional structural deformation (Bartley et al., 2001), but have not been subjected to regional or contact metamorphism. In the Turukhansk Uplift succession, limestone of the Linok, Sukhaya Tunguska, and Burovaya formations is uniformly micritic with no evidence for recrystallisation in the presence of non-marine fluids (Bartley et al., 2001). Limestone of the Miroyedikha Formation exhibits a range of petrographic fabrics that indicate varying degrees of recrystallisation (Bartley et al., 2001). 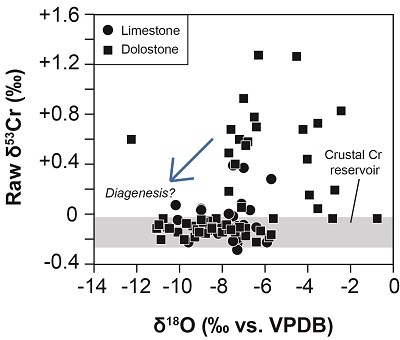 Well-preserved Proterozoic limestones and dolostones typically have δ18O values between –6 and –10 ‰ (Bartley et al., 2007; Kah et al., 2012; Gilleaudeau and Kah, 2013a), providing a benchmark by which to assess the preservation of our samples. Deposition in the El Mreiti Group began after formation of a regional peneplain and progressive marine transgression across the craton (Bertrand-Sarfati and Moussine-Pouchkine, 1988; Benan and Deynoux, 1998) - beginning with sandstone, siltstone, and shale of the Khatt Formation. δ13C and δ18O are both commonly lowered through diagenesis, although higher δ18O values can be imparted through interaction with saline burial fluids (Dorobek, 1987). Using modifications on a previously described procedure (Frei et al., 2011), ~1 gram of powdered sample was spiked with 50Cr-54Cr double spike (Schoenberg et al., 2008) to a 4:1 sample to spike Cr ratio. The only previously published study on Cr-isotopes in carbonate rocks (Frei et al., 2011) demonstrated stratigraphic δ53Cr trends that mirror primary δ13C trends across a mixed limestone-dolostone interval. Vazante Group stratigraphy has recently been revised based on field observation of a thrust fault that juxtaposes late Mesoproterozoic strata above Neoproterozoic strata of the St. Antônio do Bonito and Rocinha formations (Geboy et al., 2013). This unit is overlain by organic-rich shale of the Serra do Garrote Formation, which has been dated using Re-Os geochronology at 1354 ± 88 Ma (Geboy et al., 2013). At the top of the Morro do Calcario Formation, a discrete diamictite interval is observed that consists of both rounded and angular cobbles and boulders that are often faceted, as well as dropstone-laden mudstone containing pseudomorphs of glendonite - a cold water carbonate mineral taken as one line of evidence for a glacial origin of Vazante Group diamictites (Olcott et al., 2005; Geboy et al., 2013). The El Mreiti Group - deposited in the north-central Taoudeni Basin (West African craton) - is comprised of >350 metres of carbonate and siliciclastic strata that were deposited in the interior of a broad epeiric sea (Kah et al., 2012; Gilleaudeau and Kah, 2013a,b, 2015). Re-Os geochronology on organic-rich shale of the En Nesoar and Touirist formations yields ages of 1109 ± 22 Ma, 1107 ± 12 Ma, and 1105 ± 37 Ma (Rooney et al., 2010), which is consistent with muted carbon isotope variability that is characteristic of global carbon isotope trends in the late Mesoproterozoic Era (Kah et al., 1999, 2012; Gilleaudeau and Kah, 2013a). Overlying units of the El Mreiti Group have been erosionally removed in the north-central Taoudeni Basin so that the Assabet el Hassiane Group lies disconformably above the Tenoumer Formation in the study area (Kah et al., 2012; Gilleaudeau and Kah, 2013a). El Mreiti Group strata have not been subjected to regional metamorphism, and contact metamorphism is spatially confined to areas immediately adjacent to Mesozoic diabase intrusions, which do not intersect the drill core sampled in this study (Gilleaudeau and Kah, 2013a,b, 2015). In the El Mreiti Group, micritic to microsparitic fabrics dominate limestone of the Touirist, Aguelt el Mabha, and Gouamir formations (Fig. S-1a), with Gouamir samples occasionally exhibiting neomorphic crystal fans formed during early diagenesis (Gilleaudeau and Kah, 2013a). By contrast, original carbonate fabrics in the En Nesoar Formation have been partially replaced by fabric-destructive, zoned, euhedral dolomite (Fig. S-1b) indicating a later stage of diagenesis during burial. It is hypothesised (Gilleaudeau and Kah, 2013a) that the flooding surface marking the base of the Touirist Formation served as a conduit for later fluid flow that affected carbonate preservation in the En Nesoar and basal Touirist formations. Mn/Sr >10 is considered altered (Kaufman and Knoll, 1995), although potentially higher Fe and Mn concentrations in low-oxygen Proterozoic oceans suggest that the use of absolute numerical cutoff values is not appropriate in many cases (Gilleaudeau and Kah, 2013a). In the En Nesoar Formation, however, elevated Mn/Sr ratios (>15) and 18O enrichment (Gilleaudeau and Kah, 2013a; Fig. S-3) are also consistent with petrographic evidence for late, fabric-destructive dolomitisation, supporting our exclusion of these samples from further consideration. Lack of depth dependence is likely related to a high degree of redox heterogeneity in shallow mid-Proterozoic environments (i.e. Gilleaudeau and Kah, 2013b, 2015), influencing the degree of in situ Cr-reduction. The age of the Angmaat Formation is constrained by a 1199 ± 24 Ma Pb-Pb age on carbonate in the formation (Kah et al., 2001), as well as a 1270 ± 4 Ma U-Pb age on subjacent volcanic rocks (Heaman et al., 1992) and a U-Th-Pb whole rock age of 1092 ± 59 Ma on shale of the Arctic Bay Formation (Turner and Kamber, 2012). The Bylot Supergroup is a thick (~6 km) succession of late Mesoproterozoic to early Neoproterozoic strata exposed within the fault-bounded Borden Basin on northern Baffin and Bylot islands, Nunavut, arctic Canada (Kah et al., 1999). Palaeoenvironments range from strongly evapourative, supratidal settings (recorded by direct carbonate precipitates, gypsum, and red beds in the Tay Sound outcrop section; Kah et al., 1999) to subtidal settings dominated by microbial mats and ooid shoals (Milne Inlet section). Carbon isotopic values are stratigraphically coherent (Kah et al., 1999) and in good agreement with globally recognised late Mesoproterozoic carbon isotope signals (Kah et al., 2012). This is due to the evapourative nature of depositional fluids in the Borden Basin, which is supported by the presence of bedded gypsum and sedimentological features such as tepee structures (Kah et al., 2001). A late Mesoproterozoic age for the Angmaat Formation is also verified by chemostratigraphic correlation with late Mesoproterozoic strata from the Taoudeni Basin, Mauritania (Kah et al., 2012). The Turukhansk Formation is characterised by fine-grained fabric-retentive dolomite that precipitated during very early diagenesis (Knoll et al., 1995), resulting in pervasive clotted micritic fabrics similar to well-preserved intervals of the Miroyedikha Formation (Fig. S-1c). Primary and early diagenetic carbonate matrix phases are fine-grained (micritic to microsparitic) and lack planar, interlocking grain boundaries (Longman, 1980). The same principles of Sr, Fe, and Mn incorporation apply to dolostones, with the caveat that the dolomite crystal lattice has a lower preference for Sr (Vahrenkamp and Swart, 1990) and a higher preference for Fe and Mn (Mazzullo, 1992) than calcite. Early replacement by thermodynamically stable dolomite can act to buffer carbonate systems against subsequent diagenesis and overprinting of geochemical signatures (Nicholas, 1996). Deposition in the lower interval began with the Bezymyannyi Formation, which is an open marine siliciclastic-dominated unit that accumulated near storm wave base (Petrov, 1993a; Veis and Petrov, 1994). The conformably overlying carbonate-dominated Linok Formation also accumulated near storm wave base, but palaeoenvironments shoal near the top of the unit (Petrov, 1993a,b) leading into intertidal to subtidal limestone and dolostone of the Sukhaya Tunguska Formation (Petrov et al., 1995; Sergeev et al., 1997). The Turukhansk Uplift succession - deposited along the northwestern edge of the Siberian craton - is comprised of thick (>4 km) unmetamorphosed carbonate and siliciclastic strata that are exposed in three thrust-bounded blocks (Petrov and Semikhatov, 1997, 1998; Sergeev, 2001). Carbonate of the Burovaya Formation is disconformably overlain by peritidal to shallow marine dolostone of the Shorikha Formation (Sergeev et al., 1997) followed by mixed siliciclastic-carbonate deeper shelf strata of the Miroyedikha Formation (Petrov and Semikhatov, 1997). Lastly, the entire succession is overlain by the dolomitic Turukhansk Formation that accumulated in shelf settings primarily between fair weather and storm wave base (Petrov and Semikhatov, 1997). Conformably overlying the Derevnya Formation is the Burovaya Formation, which accumulated along a carbonate ramp associated with stromatolitic bioherms (Petrov and Semikhatov, 1998). By contrast, meteoric or deep burial diagenesis - in the presence of fluids different in composition than primary marine fluids - produces coarse-grained spar that often exhibits planar, interlocking grain boundaries, with the exception of grain micritisation processes that can produce fine-grained carbonate phases through recrystallisation and infilling of endolithic microborings (Reid and Macintyre, 1998). The external reproducibility of our measurements was assessed by comparing long-term average δ53Cr values for NIST SRM 979 and NIST 3112a measured on the IsoProbe T and the Phoenix to accepted values from other laboratories (Schoenberg et al., 2008). Measured δ53Cr values were +1.80 ± 0.06 ‰ for JLs-1 and +1.64 ± 0.03 ‰ for JDo-1, both of which are in good agreement with published values (Schoenberg et al., 2008). The calculated fraction of detrital Cr was then used to separate the isotopic composition of authigenic Cr in carbonate from the isotopic composition of detrital Cr, which is derived from average crustal values (–0.123 ± 0.102 ‰) (Schoenberg et al., 2008). In this equation, we set δ53Crdet = –0.123 based on average crustal values (Schoenberg et al., 2008). Age constraints are lacking on the units above the disconformity, although they are generally assigned to the early Neoproterozoic (~900 Ma) (Sergeev et al., 1997; Sergeev, 2001). In the modern ocean, Cr-isotope heterogeneity occurs with depth - controlled by biologically-mediated Cr-reduction in surface waters and the oxygen minimum zone, as well as re-oxidation of Cr(III) in deep water (Scheiderich et al., 2015). We also performed corrections using post-Archaean Australian shale (PAAS) values (Taylor and McLennan, 1985) instead of the average shale composite of Wedepohl (1991), but found <2 % differences in estimates of detrital Cr contribution and <0.02 ‰ differences in corrected δ53Crauth values. Additionally, dolomitisation can occur during a variety of diagenetic stages that can also be identified petrographically (Tucker, 1983). The dominantly dolomitic Angmaat Formation lies conformably above mixed carbonate-siliciclastic strata of the Arctic Bay and Nanisivik formations (among others; Turner and Kamber, 2012) and is, in turn, unconformably overlain by the carbonate-dominated Victor Bay Formation. Differential subsidence and graben development controlled lateral facies distribution during deposition of the Angmaat Formation (Turner and Kamber, 2012). Strata have not experienced regional metamorphism, and contact metamorphism occurred only in close proximity to the Neoproterozoic Franklin swarm of mafic dykes (Turner and Kamber, 2012), which have not influenced the sections examined in this study. Despite the lower preference of dolomite for Sr in the crystal lattice (Vahrenkamp and Swart, 1990), Mn/Sr ratios are uniformly <10 (commonly <5), excluding one sample (Mn/Sr = 10.33). In addition to reporting raw δ53Cr values determined by TIMS, we also used sample Cr/Al ratios compared to average detrital sediment - using average shale composition as a proxy (Cr = 90 ppm; Al = 88,900 ppm) (Wedepohl, 1991) - to determine the fraction of Cr sourced from detrital material for each sample. In this equation, we set [Cr]avgsh = 90 ppm and [Al]avgsh = 88,900 ppm based on average shale values (Wedepohl, 1991).